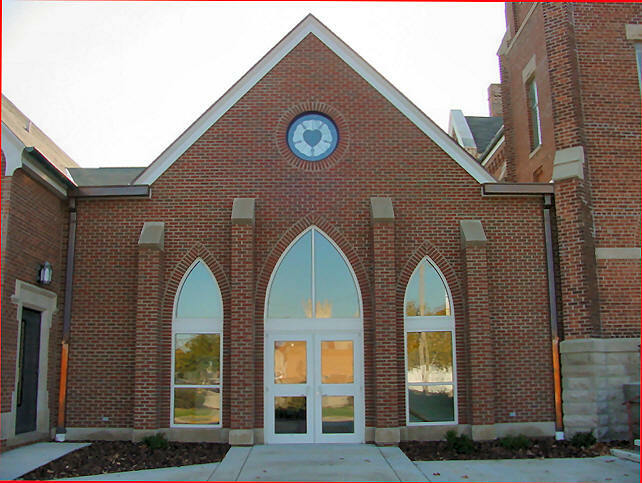 [NOV. 5, 2005] After years of battling steep church entryway steps and stairs throughout the education building, members and friends of Zion Lutheran Church in Lincoln will have an easier time using the church buildings. The congregation celebrated the opening of a new building addition, which connects the sanctuary and the education building, last Sunday. "The leaders of Zion have long recognized that to fulfill our mission of 'Sharing Christ's Love with Every Generation,' the 1903 church and the 1953 education building had several limitations," noted the Rev. Mark Carnahan. The new addition addresses these limitations by providing an elevator to both the sanctuary and the education building and by adding handicapped-accessible restrooms. A curbside drop-off area has been added. The church office also has easier access. The building addition also includes more classrooms for Bible study and meetings and a larger space for fellowship before and after worship services. The architectural plan, prepared by Paul Young and Associates of Bloomington, preserves the historic appearance of the buildings. Felmley-Dickerson of Bloomington was the general contractor. The new area features a stained-glass window of the Luther Rose, which was Martin Luther's coat of arms and has been an identifying symbol of the Lutheran church since the 16th-century Reformation. The window was created by Brooks Art Glass of Springfield. "The most exciting thing about our Building for the Generations program is that now every generation has access to God's house," Carnahan said. [NOV. 5, 2005] EMDEN -- In the aftermath of the Gulf Coast hurricanes, helping your neighbor continues. It has been requested that congregations put together "Thanksgiving boxes of love," which will be given to families in need along the Gulf Coast. The goal is to fill a semi that will go down the week of Thanksgiving. Bring your food box to St. Peter Lutheran Church before Nov. 14. This is one way you can encourage families to celebrate Thanksgiving by giving to another in need. Your box might also include a greeting from your family to another. St. Peter's will deliver the boxes to St. John's Lutheran Church in Danforth. Pastor Hofer will be at Trinity Lutheran Church, Kankakee, with Pastor Jewell. Pastor Hofer will be in Pekin to help with their Stewardship Sunday: "New Consecration Sunday."